Have you ever wondered how you can make money reading Tarot? Back in the early 2000s, I started my online Tarot reading business with $10 Celtic Cross readings. It was a fun way to earn money doing something I loved! And sure, I wasn’t going to be able to retire on these $10 readings, but it was a rewarding way to spend my Saturday afternoons when I was working in corporate full-time. Reading Tarot for payment can be a fun side hustle or a way to generate a little extra cash while you work your normal day job. And it’s easier than you think. You can start earning an income reading Tarot for others in no time. Whether it’s $20 an hour, $50 an hour, or even $300 an hour. Check out my steps for how you can start making money reading Tarot! 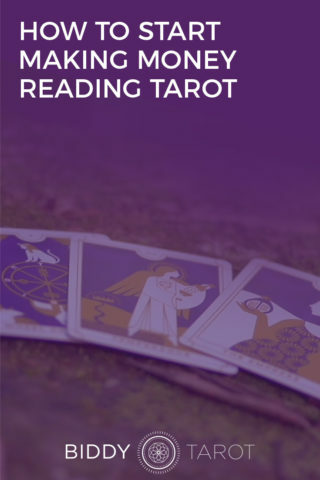 Before you even think about accepting payment for your Tarot readings, make sure that you learn the basics of reading Tarot and are confident in your skills and abilities. 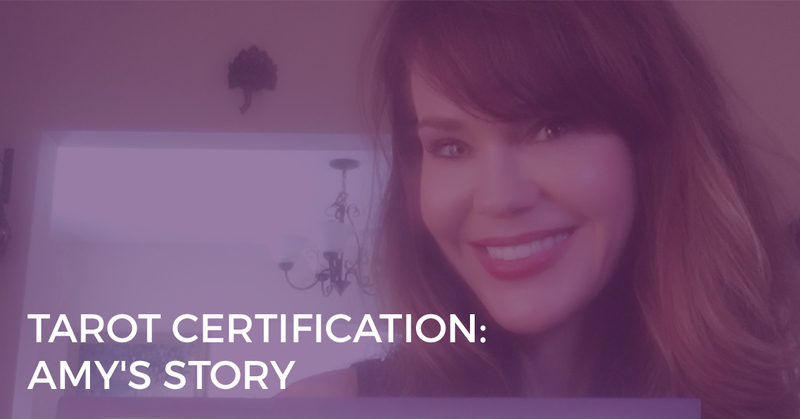 If you’re relatively new to Tarot, start with the Biddy Tarot Certification Program. In just 7 months, you’ll learn how to master the Tarot cards and read Tarot with confidence, plus you’ll get hands-on experience reading Tarot for others. And, if you complete the program successfully, you’ll walk away with the title, Certified Biddy Tarot Reader which will help your street cred significantly. If you just want to brush up on your Tarot reading skills instead, then take the Read Tarot with Confidence program and discover how to create valuable and meaningful experiences for your Tarot clients. You’ll know you’re ready to start charging for your Tarot readings when you know the meanings of the cards without looking them up in a book, you’re comfortable with a few different Tarot spreads, you’ve practiced giving free readings to people you don’t know and you’ve been receiving positive feedback and nudges from the Universe. Start by setting your Tarot reading prices at a ‘comfortable’ level. Not super low (like I did with a $10 Celtic Cross reading), because people tend not to value ‘cheap’ things. But not so high that you feel a huge weight of pressure from your clients, as you get started. 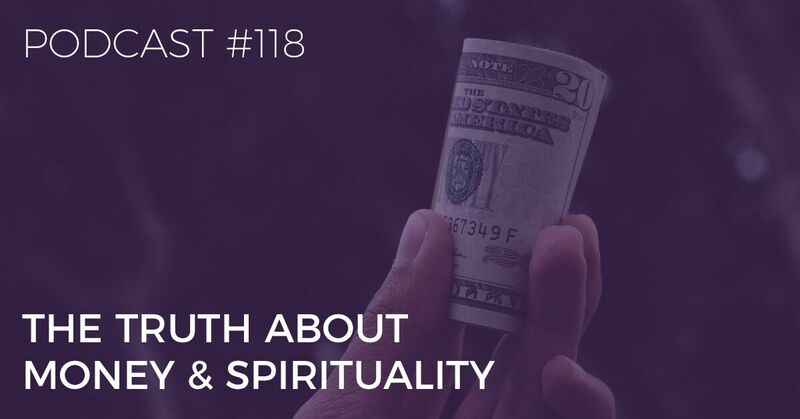 As a guide, you might start out at $30 for a one-question reading or $50 for a two-question reading. Know that you can increase your prices as you go. In fact, I recommend that you set a date for when you will raise your rates and stick to it. That way, you won’t be put off by any feelings of self-doubt or lack of confidence! As soon as you find your first client, you want to make sure it’s easy for them to pay. So, before you take the next step, find a way for clients to pay for your readings. You might choose PayPal, bank deposit, or TransferWise. Be sure to read the terms and conditions for any payment processor as some (such as Stripe) will not accept payments for psychic readings and you could have your account and payments cancelled with no notice. Before you start accepting payment, make sure you have checked your local legal and tax obligations. In some situations, you may be required to declare your earnings for tax purposes. Or, you may be required to get a permit for reading Tarot in your local area. Do your research so you don’t get caught out! Now you’re set up and ready to go, it’s time to get the word out. Start by letting your friends and family know that you’re offering paid Tarot readings. They may want to take you up on your new services, or they may be able to refer you to a friend or colleague of theirs who would be a good fit. If the idea of telling your friends and family that you’re into Tarot is freaking you out, then hand pick a few of your trusted friends instead and ask them to spread the word to the right people. Everyone loves a special offer! Rather than offering a discount (which takes away from the value of your Tarot reading), offer a bonus or a package deal. For example, for the first 10 people to book a reading with you, offer a free guided visualisation or a customised ritual they can do based on the reading. There are so many different ways to put yourself out there and start reading Tarot for payment. 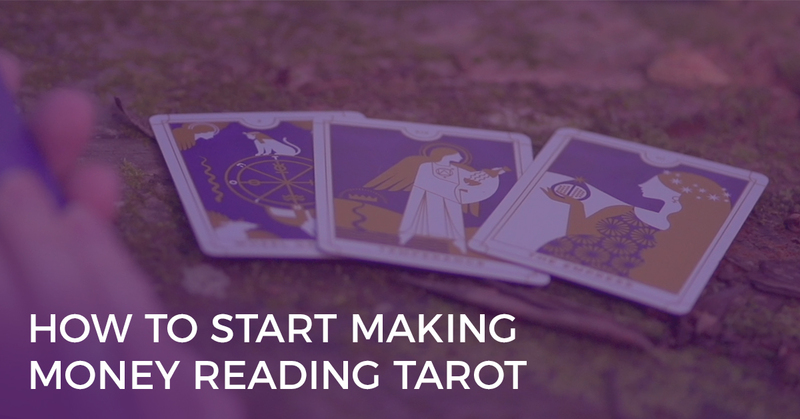 Start with a simple email Tarot reading, or offer phone readings. Think about where your ideal client hangs out – perhaps a heart-centered Facebook Group, a local Meetup, or a women’s circle. Be part of these groups and contribute LOADS of value first. Then, provided the group guidelines do not prevent you from doing so, share more about what you do, who you serve and how you add value. Keep in mind that there’s a fine line between helping someone and being a salesy pain in the a**. Always come from a place of serving others, rather than trying to push your Tarot readings. Be ready to help and if it feels appropriate, offer your paid services. 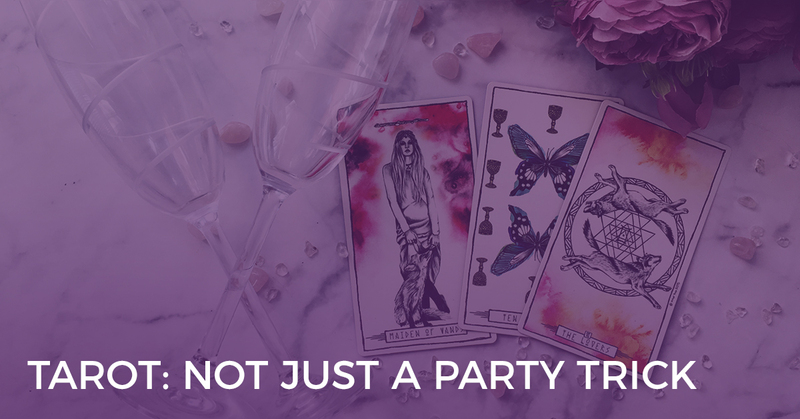 You might start out by offering email Tarot readings, but after a few readings, your clients are asking to meet you in-person or over the phone. Listen carefully because they are giving you valuable ideas on how you can expand your offerings! You might also notice that many of your clients are asking about a similar topic, such as career. Add extra value by creating a workshop for aligning your career with your soul purpose, using Tarot as a guide. Or creating a guided meditation specific to finding your ultimate career. Ask your clients, too, how you can continue to serve them in their journey, or what’s next for them. Explore how you can help and how you can extend your services to support them throughout their full life path. Over time, your Tarot side hobby may start to show potential for becoming a thriving business. More clients, more cashflow, and more excitement and enthusiasm to make this your ‘thing’! If you’re ready to take the leap and explore what’s possible, register for my free training Grow Your Tarot Business Online to discover the six secrets to creating a living doing what you love.